The Uphaar cinema tragedy that took place on June 13, 1997, claiming the lives of 59 people and injuring over 100 was one of the worst fire incidents in Indian history. 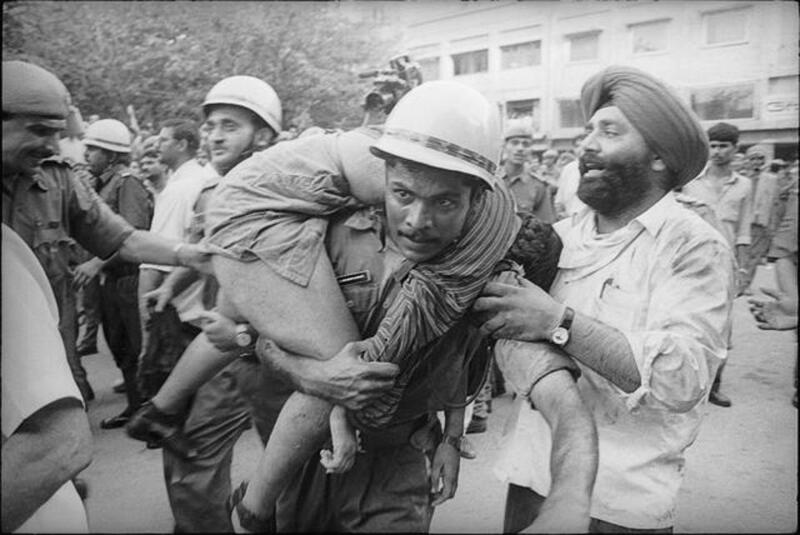 The incident that took place in the midst of the matinee show screening of ‘Border’ has also gone down the annals of legal history in the country as being the cause behind the filing of the landmark civil compensation case by the families of the victims through their organization, AVUT (Association of Victims of Uphaar Fire Tragedy). In this exclusive interview, Sourya speaks to the President of AVUT, Mrs. Neelam Krishnamoorthy, whose 17-year-old daughter Unnati and 13-year-old son, Ujjwal, were also among the victims of the incident. Sourya (S): Please paint a word picture for us of the fateful day of 13th June 1997 and how tragedy broke out. Ms. Neelam Krishnamoorthy (NK): It was the month of June 1997, vacation time for the children. On Friday the 13th June, Unnati and Ujjwal planned to go watch a movie. They were very excited about watching the much-awaited and controversial new movie “Border”. The tragic day started off normally. Unnati asked me to book tickets for the matinee show of Border on the day it hit theaters. The four of us had lunch together. Naturally, none of us knew or imagined that it would be the last meal we would have together as a family. After lunch Unnati planted a loving kiss on my cheek; I forgot to wipe off the mark her lipstick left on my skin. I had no clue that this would the last time Unnati would ever kiss me. Soon we also left for work. After work, we went to look up my brother –in - law who was admitted to the hospital. I gave a call at around 7.30 pm, to check if the kids had reached home, but there was no response.We rushed home, to check if the kids had returned, but they had, not. The house was in darkness and I quickly went to my puja room and lit a lamp and prayed to god asking for the well-being of our children. I tried calling up Uphaar Cinema but could not get through to their number. I also tried AIIMS but the number did not get through. Just then one of Unnati’s friend called us and inquired about her. When I told him about our predicament, he informed us about the fire in the Uphaar cinema. We rushed to Uphaar cinema and on the way informed all our friends about the fire. Throughout the way we were praying for the well-being of Unnati & Ujjwal. We could not enter the Uphaar cinema as the entire area was cordoned off and we were asked to check at AIIMS or Safdarjung hospital. On reaching AIIMS neither we could locate our children nor were their names in the list of injured. We were taken to the OPD where we saw the bodies of Unnati & Ujjwal lying on a stretcher. Our lives came to a dreadful standstill. This nightmarish turn of events destroyed us completely and changed our lives forever. The fire had originated from the Delhi Vidyut Board transformer at 4.55 pm, which was located in the parking area of the cinema complex on the ground floor. The “B” phase cable detached from the bus bar and fell on the fin of the transformer as result the oil from the fins leaked and caught fire. The fire came in contact with a car parked illegally right in front of the transformer room. The fire spread to the other cars parked in the area. The smoke entered the hall due to chimney effect through the staircase and air-conditioning ducts. Soon the cinema hall turned into a gas chamber. The 750 patrons sitting on the first floor of the auditorium escaped immediately thanks to the properly spaced exits. The staff in the basement and the tenants on the ground floor, those closest to the fire, along with those in the third and fourth floor, all escaped. As smoke and carbon monoxide engulfed the balcony, the patrons began to suffocate and there was complete pandemonium. Despite the fact that a fire had broken out, the projector operator was not instructed to stop the film; neither were the patrons informed of the accident nor were they given instructions on how to leave the auditorium and the balcony. When the electricity failed completely it became even more difficult for those in the balcony to make their way out. 302 patrons in the balcony were trapped due to non-availability of gangway and exit. The gangway was blocked to accommodate additional 52 seats in violation of the statutes to make extra profit. The exit gate on the right side was blocked by erecting an eight seater private viewing box for the comfort of Ansal’s family. The basic fire safety provisions such as exit light, foot lights, emergency lights and public address system were non-functional. The cinema management abandoned the patrons and ran out of the cinema hall. 59 people were asphyxiated to death due to carbon monoxide poisoning and, over 103 were grievously injured. (NK): After performing the thirteenth day rituals for our children, Shekhar and I went through each and every paper that came out on 14 June, and then every single day after that, to try and figure out what exactly happened. As per the newspaper reports the deaths occurred only in the balcony due to violations and deviations of the statutes. Additional seats in the balcony were accommodated by the management by blocking the gangway and exits. We decided to take legal recourse. We were advised by a good friend to seek a legal opinion from senior advocate K.T.S. Tulsi. Mr Tulsi had strong views on those who seemed responsible for the tragedy. He told us that since the Ansals were part of the powerful builder lobby, we should fight this legal battle collectively. He suggested that we contact other affected families and form an association. We did not know any of them personally. We took the initiative and contacted members of the victims’ families. Some were downright dismissive of our efforts, but a few of them listened to us very patiently. Ultimately, nine families responded positively to us and we proposed a meeting. The Association was formed on 30th June 1997 . AVUT was born out of terrible rage and endless grief. (S): There were charges against the family of the accused, of trying to cover up the matter during the initial investigation. How reliable had you found the initial investigation conducted by the Crime Branch of Delhi Police? Was the Association of Victims of Uphaar Fire Tragedy' (AVUT) relieved when the investigation was handed over to the CBI instead? (NK): The initial investigation into the Uphaar Cinema fire was handled by the Hauz Khas Police Station. The First Information Report (FIR) was lodged on the basis of a complaint made by the security guard of the hall. The Delhi Police lodged the FIR under section 304 (II), i.e. culpable homicide not amounting to murder with a punishment of up to ten years in prison. Considering the gravity of the incident, the investigation was then transferred to the Crime Branch of the Delhi Police. Initially, the investigation conducted by the Crime Branch seemed to be reliable. After almost over a month Sushil Ansal and his son Pranav Ansal were arrested from Mumbai on 22nd July 1997, but however, Gopal Ansal was absconding. We were assured by the Crime Branch that they would file the charge Sheet by August 1997. The Association was satisfied with the progress of the investigation that was being conducted by the Crime Branch, Delhi Police. But, to our utter shock and disbelief, the Government of India took a suo moto decision to transfer the case to the Central Bureau of Investigation (CBI) on 23 July. AVUT never made any representation to the Government to transfer the investigation to the CBI. It was our belief that this was done with the motive of delaying the filing of the charge sheet and, in the process, making it possible for the accused to seek and obtain bail. Our apprehensions were proved right when CBI filed the charge sheet on 15th November 1997, charging Sushil & Gopal under a lesser offense i.e 304 (A) death caused due to rash and negligent Act, contrary to what Delhi Police had charged them. (S): The Prosecution, the Judiciary or the CBI – who among these would you blame for the unreasonable delay caused in this case despite, in your instance, the Delhi High Court rapping the lower court for the slow proceedings in the case. (NK): I would blame the defense counsels who sought frequent adjournments and moved frivolous application which delayed the proceedings considerably. The courts too accommodated the defense counsels by giving frequent adjournments sought by the defense counsels. Since I was present in the court for each and every hearing, I ensured that the Prosecuting agency does not delay the proceedings by seeking adjournments. AVUT had to approach the High Court thrice during the trial to expedite the proceedings. But for the intervention of the higher court the case would have been still in the session court. (S): What was your reaction when you heard that the initially Delhi High Court had granted compensation of 18 crores? At that moment did you have hope that the Justice would ultimately be served and the accused sent to jail for a long time? (NK): After going through the judgment pronounced by the Delhi High Court on 24 April 2003 wherein the court held that the fire had originated at the DVB transformer due to negligence in its maintenance. The fire would not have been so tragic had the cars not been parked right outside the transformer room and the exits not blocked to create a private box for the owners. The court also observed that had exits been located on both sides of the balcony, precious lives might have been saved as the patrons could have made their way outside the theater quickly. The licensee (the owners) had committed statutory violations in order to obtain illegal profits. The licensing departments of the Delhi Police, Delhi Vidyut Board and Municipal Corporation of Delhi were all found guilty of contributory negligence due to their apathy and indifference to the critical matter of public safety. After such detailed and comprehensive judgment, we were hopeful that in the criminal case Ansals would be convicted and would be incarcerated for a long time. (S): What was your reaction when on 19th August 2015 the Supreme Court let off the Ansals directing them to pay Rs 60 crore for a trauma center and the subsequent order in the review filed by AVUT & CBI? (NK): The Ansals were convicted on the 5th March 2014, the bench of the Hon’ble Supreme Court differed on the quantum of sentence after concurring on their guilt under Section 304A of Indian Penal Code for negligent acts.The bench referred determination of sentence to a three-judge bench. The matter was listed after seventeen months that too after AVUT & CBI had moved applications for early hearing. The matter was finally listed on 19th August 2015. The SC verdict of 19th August 2015 left me distraught and disappointed. The Judgement was pronounced without giving the Petitioner or the Special Public Prosecutor any chance of meaningful and effective hearing. We were appalled when the judges pronounced the operative portion of the verdict, sentencing the Ansals to the period undergone and directed them to pay Rs 60 Crore to the Delhi Government for a Trauma Centre in lieu of a sentence. Aggrieved by the judgment a review petition was filed by both CBI &AVUT since it suffered from serious errors which were apparent on the face of the record. The review petition was heard in an open court on 14th December 2016 and the judgment was pronounced on 9th February 2017. The court sentenced Gopal Ansal to one-year imprisonment; however, Sushil Ansal was allowed to walk free. His sentence of imprisonment was reduced to the period undergone.The court also held that there is no provision under the IPC for substitution of the sentence by fine. Hence Sushil & Gopal Ansal were sentenced to a fine of Rs 30 Crore each for a Trauma Centre. With this judgment, the message was loud and clear that the law of the land is not the same for the rich and powerful. I realized that I had made a mistake of going to the courts to seek justice for my children. I should have rather shot those responsible for the death of my children. By now I would have finished serving the sentence as well. Such a judgment will only embolden the owners of public spaces to violate safety rules and compromise on safety, with no thought of endangering human lives. (S): What according to you, would be been Justice? (NK): Looking at the gravity of the offense the Ansals should have been convicted u/s 304 (II) IPC (Culpable homicide not amounting to murder). But since they were convicted u/s 304 (A) (Rash and Negligent Act) the Supreme Court should have given maximum sentence of 2 years to send a strong message to the society. (S): Despite the system failing you, do you have hope that the evidence tampering case pending against the accused might bring about some redemption? (NK): The conviction in the evidence tampering case will bring some redemption unless the same magnanimity is shown to Ansals as in the main Uphaar Case taking their age into consideration. After all, they are growing older and not younger anymore. (S): Throughout the last 20 years you have faced some of the worst’s sides of litigation and judiciary in the capital. You have also faced a lot of trauma, harassment, and hardships from the Counsels of the accused. In the opinion of a citizen and a victim, do you belief that lawyers have any moral right to consider themselves to be a part of a “noble profession”. (NK): The behavior and the attitude of the defence lawyers representing the Ansals has been a cause of great pain and agony for us. While we hold no malice towards them for representing the Ansals, and we also understand their professional commitment towards their clients, we cannot forgive them for the personal attacks they made against us repeatedly. Lawyers are expected to be the guardians of rule and law. They are the officers of the court and hence, cannot play its spoilers. It does not behoove members of the bar to glorify themselves over hapless victims and litigants who are constrained to visit the court on the dates of hearing, hoping for justice. The entire legal fraternity cannot be painted with the same brush though. We have also come across some deeply committed lawyers who have shown immense conviction in the case and have stood by our side in this epic battle for justice. (S): You, along with your husband, wrote a book “Trial By Fire” detailing your experiences during the trial. Did somewhere, the process of writing the book, lessen the pain and the burden? (NK): The process of writing “ Trial By Fire” was challenging. We had to come out of our comfort zone to narrate the personal tragedy we had undergone. It neither lessened the pain nor the burden. (S): Beyond this case has AVUT gone beyond into policy making sphere to make sure such a horrible incident never happens again. Could you please tell us about that. (NK): We at AVUT could not comprehend how man-made disasters could be treated merely as a rash and negligent act. Hence we made a representation to the government to bring about a new law to deal with man-made disasters. AVUT presented the petition for a proposed legislation to prevent man-made tragedies in public places to the then President, Pratibha Patil, the chairperson of the United Progressive Alliance, Sonia Gandhi, and the then law minister, Veerappa Moily. In 2009, the law ministry forwarded our petition to the Law Commission, directing it to come out with a law to deal with such disasters on a priority basis. We had several meetings with the chairman of the Law Commission and gave him many inputs, illustrating how such cases were dealt with in other countries. In 2012, the Law Commission published a consultation paper dealing with man-made disasters, which we are sure is collecting dust in an obscure corner of the ministry.Maybe the Government will bring in a law when a VVIP’s kith & kin are victims of such a man-made disaster. (S): Does AVUT have plans to file a curative petition against the discharge of one of the accused? And what action is AVUT planning to take to counter the mercy petition filed before the President for the other accused? (NK): Yes, AVUT would be filing the curative petition at the appropriate time. As regards mercy petition filed by Gopal Ansal, the same was forwarded by the MHA to Lt. Governor and the Delhi Government for their opinion. AVUT gave representation to both Lt Governor and the Chief Minister not to consider the mercy plea filed by Gopal Ansal since using discretionary powers to provide mercy for the rich and powerful is sure to send a wrong signal to other wrongdoers who will doubtless be emboldened by any mercy shown. Hence, we requested to reject the blatantly undeserving mercy plea filed by a convicted mass murderer. The Lieutenant Governor and the Delhi Government have given their recommendation to reject the mercy petition.